Lebanese protesters chant slogans during a protest against corruption and criticizing long-serving politicians for failing to form a government, in Beirut, Lebanon, Nov. 22, 2018. 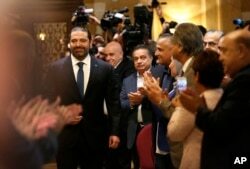 Journalists and supporters of Lebanese Prime Minister-designate Saad Hariri, left, clap as he arrives for a press conference, in Beirut, Lebanon, Nov. 13, 2018. The vote, in which the Shi'ite militant Hezbollah group and its allies made significant gains, did little to pull Lebanon out of a political impasse. Anger against politicians' apparent indifference, worsening public services and distress over down-spiraling finances and gloomy predictions are building up. "There is no independence [to celebrate] because corruption is eating us up," said Mohammed al-Rayyes, a shop owner in Beirut's Hamra district. "The coming days are going to be very difficult." "If we don't go about these reforms fast, the Lebanon that we know will fizzle away,'' he said.